SAB-Mag Two Piece Magnetic Card Holder. 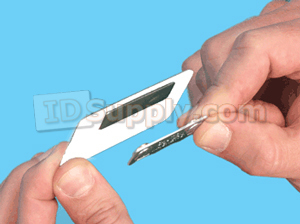 Pressure-sensitive foam adhesive pad with peel away liner sticks to the back of your ID card or nametag. Attaches your ID to clothing via the magnetic force of the two pieces. Magnetic badge is 1-3/4" long x 1/2" wide.